Cold weather has come to the Outer Banks of North Carolina. After a very warm fall and early winter, a sudden drastic drop in temperature caused havoc with the juvenile sea turtles in the Pamlico Sound (see map below). As we know, sea turtles are cold-blooded animals, so therefore their body temperatures are determined by the environment around them. When the air or water temperature drops, their body temperatures drop. If it is too cold, their bodies shut down and stop working. They become cold-stunned and are danger of dying. The movement of the water brings them to the edge of the sound where they flounder or lay still. If they are not rescued, they will die. Usually, as fall and winter arrives, the temperature gradually drops so the turtles know to move to warmer water. This year they didn’t get the clue and were shocked when the temperature suddenly dropped below freezing. 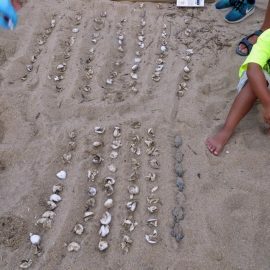 Until this year, 40 turtles in one week were the most that were found. 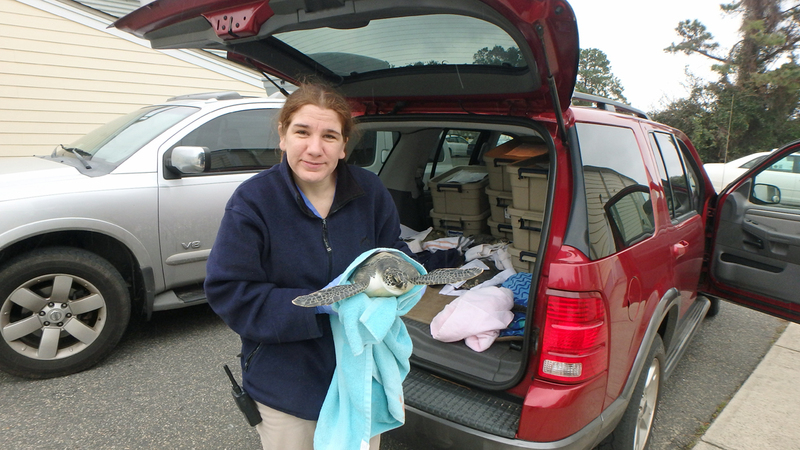 This year, in just two days in early January, volunteers patrolling the sound side of Hatteras Island found 349 cold-stunned turtles. All but two were juvenile green sea turtles, probably three to five years old. People volunteered to patrol all along the sound side of the island (see the video below of rehabilitator supreme Lou Browning on patrol). Luckily, in anticipation of such an event—which in our wildest nightmares would not have been even close to what we actually experienced—a staging area was set up in Buxton on Hatteras Island to receive and process the sick animals. The area was full of turtles. 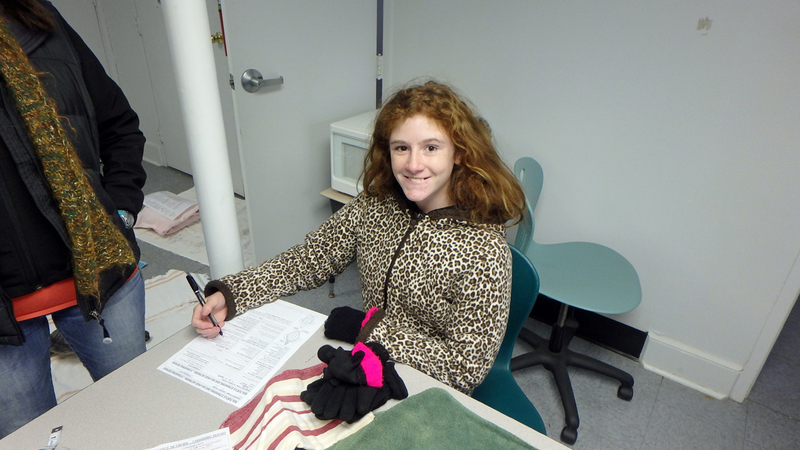 Haley Rossell, a sixth grader at the Cape Hatteras Secondary School of Coastal Studies, was just one of many trained volunteers. 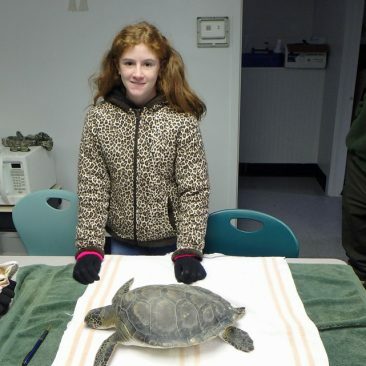 As a member of the Young Naturalist Club led by teacher Linda Austin, she is trained to help with stranded sea turtles. She found an immobile turtle at the edge of the water near her home in Hatteras Village and took it to the staging center in Buxton. Haley then rode her bike in miserable weather all over Hatteras Village, pulling turtles out of the water and centralizing them into one location. A friend drove by and offered to give her and seven turtles a ride, so she left her bike and jumped in the car and got her turtles to the center. She completed the rest of the day and evening working in the staging center to help process the massive number of turtles coming in. 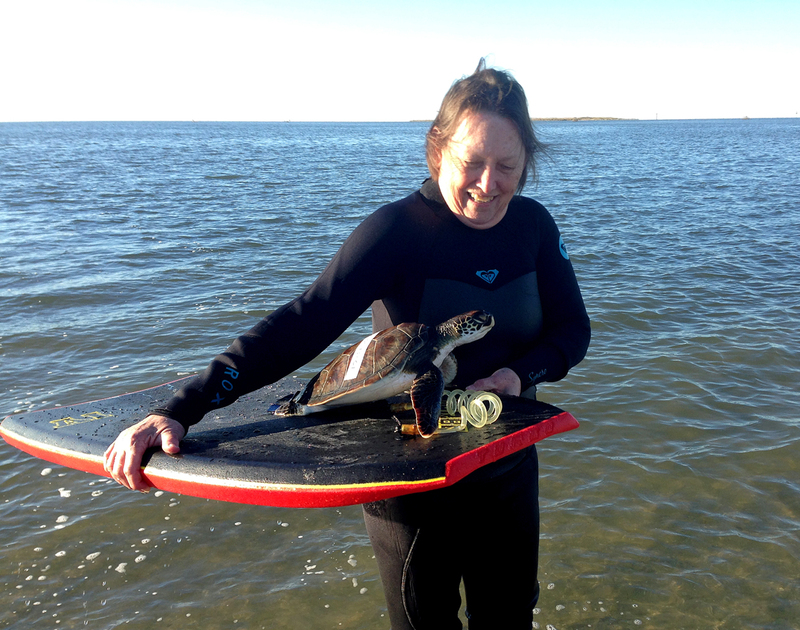 Over the last two weeks Haley has saved ten endangered sea turtles—she was just one of many volunteers that slogged through the frigid marshy water looking for cold-stunned turtles. [We] have a team of six students that are advanced trained for cold stun processing. These students also collect turtles from the soundside but are pulled from classes at school when the center starts hopping with intake and are transported over to work processing with other NEST volunteers. 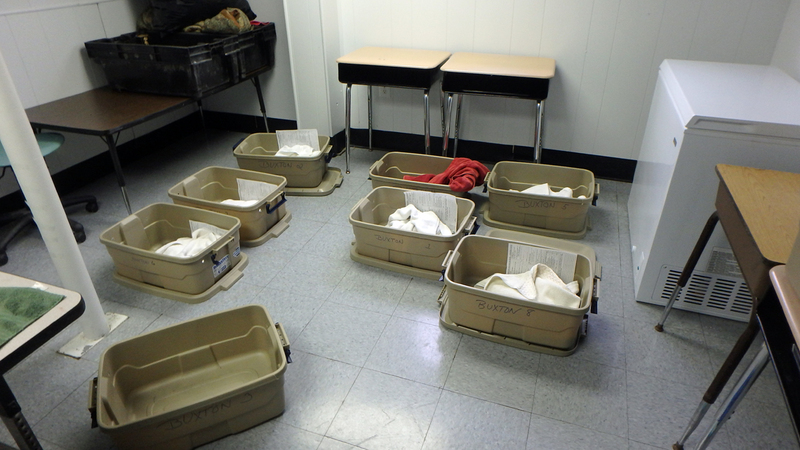 They scan for tags, body temperatures, measurements, and complete the stranding reports. They are a huge asset and absolutely love their work. We have another group of students that complete necropsies on those turtles that are brought in but dead. They also complete necropsy forms and submit the reports to the assigned agencies…. 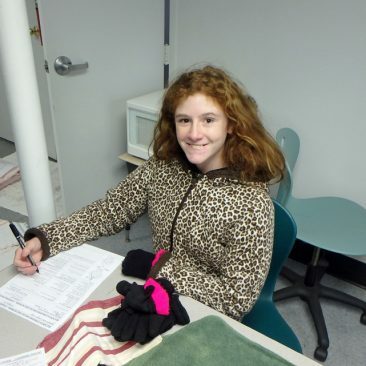 Our Young Naturalist Program is in its sixth year and focuses on students in grades 6-12. We have permanent programs of study each year, such as cold-stun, mammal stranding, seal stranding, canine studies (which includes Red Wolves), eastern Carolina bears, snakes and frogs. Additionally, we complete field studies on environmental issues such as barrier island dynamics—in which we completed several seminars with the Eastern Carolina University geology department—conchology, birding, deer counts, etc. We have numerous partners, including North Carolina Wildlife Resources Commission, U.S. 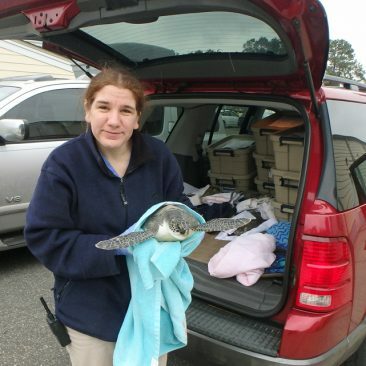 Fish and Wildlife, National Park Service, NEST, Hatteras Island Wildlife Rehabilitation and Outer Banks Wild Care. Students are able to work with experts in field studies while developing their individual interest niches under environmental programs. At the staging area, Haley measured and documented her turtle. 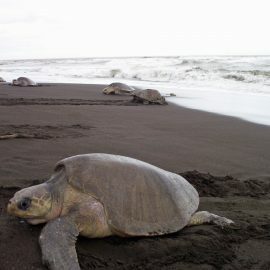 The report is filed with seaturtle.org, a website that tracks turtles and turtle strandings, and a copy is placed in the bin with the turtle. We quickly ran out of towels and bins to put the turtles in. 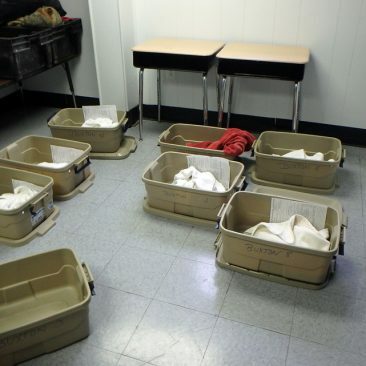 All of the turtles were then transported to the Sea Turtle Aquarium Rehabilitation (STAR) Center at the North Carolina Aquarium on Roanoke Island to be treated. Under the watchful eye of head rehabilitator Rose Mary Lucas, the animals’ vitals were taken and they were prepared for treatment. The animals had to be warmed up very slowly. As you can imagine, the sheer number of turtles quickly overwhelmed the aquarium. After each turtle’s body temperature rose, it was given a swim test. It was imperative that, when placed in the water, each turtle could swim and dive. Those that passed the test were prepared for transfer to warmer waters. 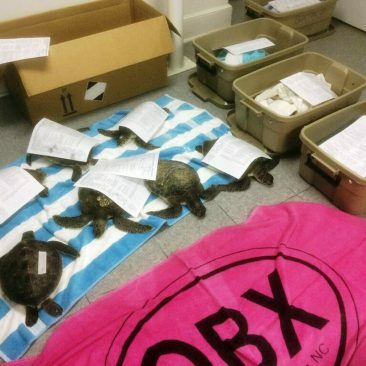 The first group of 89 turtles that passed the swim test was driven to Florida for release. 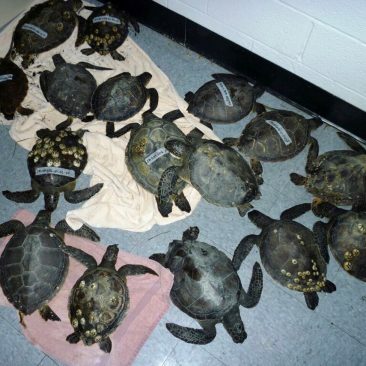 The next day, over 200 turtles were driven in three trucks to Morehead City, North Carolina where they were placed on boats and taken to the warm Gulf Stream. 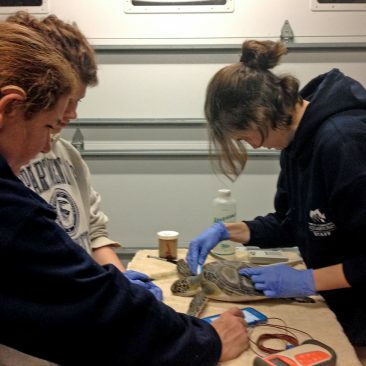 Of the 349 cold-stunned turtles found, only five died. Luckily the next day warmed up. 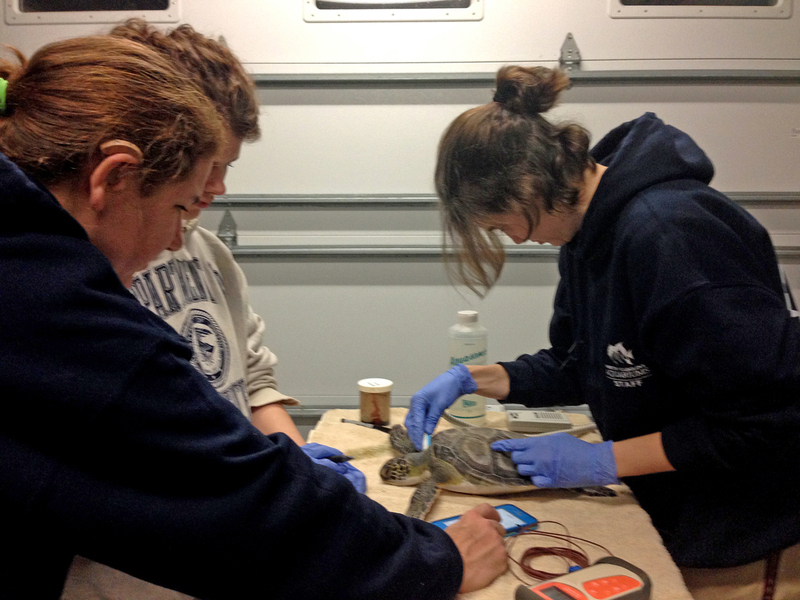 The next week, though, as the temperature dropped again, 16 more turtles were found. Because the aquarium was overwhelmed with all of its patients, rehabilitators decided to give 13 of the most active and alert turtles a swim test in the warmer waters at the Hatteras Inlet. If the turtles could swim and dive, they swam with the outgoing tide to warmer ocean waters. Six of them passed the test and quickly swam to freedom. 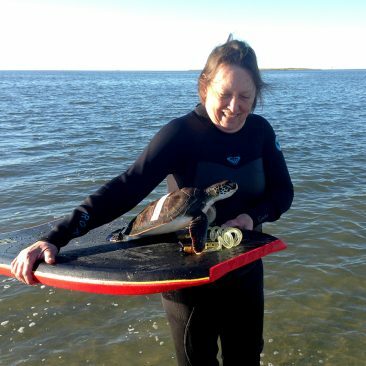 As one of them swam away, it could be seen to be struggling, so Hatteras resident and turtle rescuer Beverly Bull donned her wetsuit, plunged into the frigid water and captured the turtle. This turtle obviously needed more rehabilitation. Seven were taken to the STAR Center. Three late arrivals were also taken to the center. 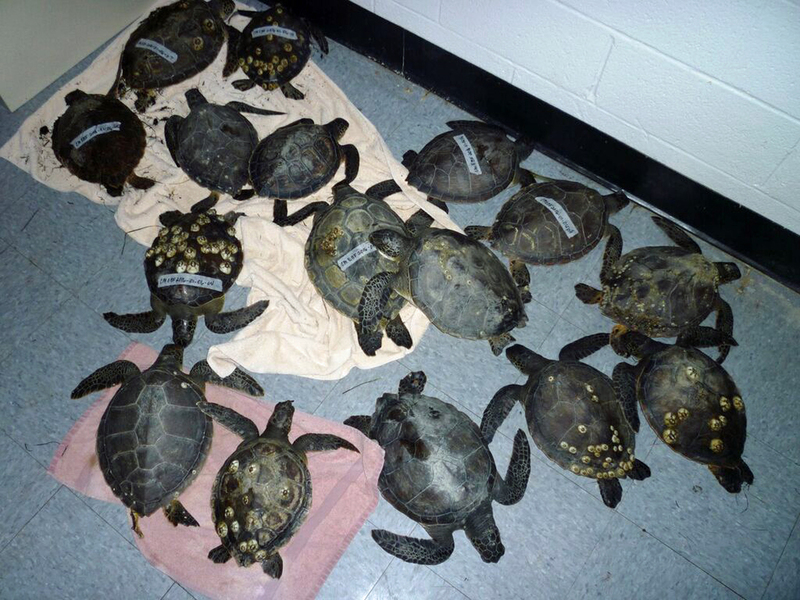 There were now 41 turtles in the Center, which is way too many for that facility. The next day 20 more turtles cold-stunned. 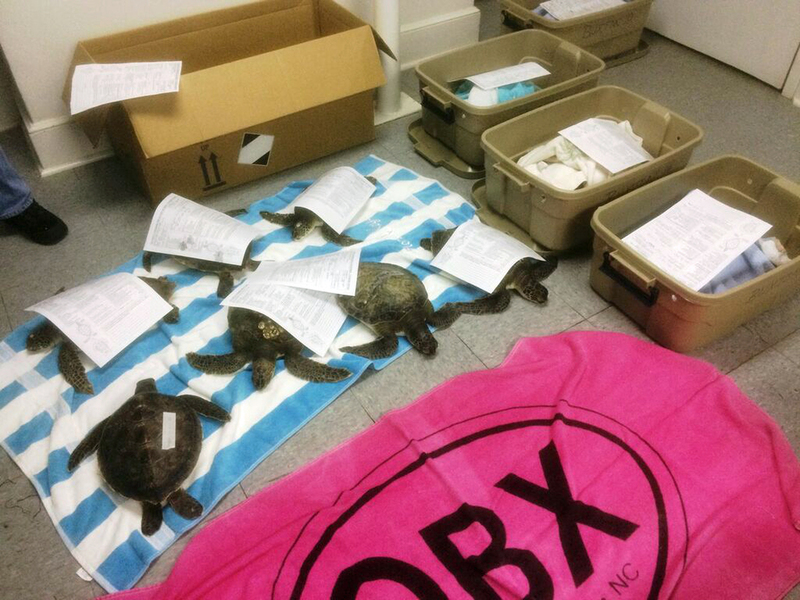 Since there was not adequate space for more turtles at the STAR Center, these were taken to the Hatteras Marina to be transported by boat to the warm Gulf Stream waters. We would like to believe that all of the turtles are safely out of the sound, but we know that, with many freezing days yet to come this winter, our work has just begun. All of this effort required many many dedicated volunteers from the National Park Service, US Fish and Wildlife Service, Hatteras Island residents, STAR Center employees and volunteers and all of the trained Network for Endangered Sea Turtles (NEST) volunteers. 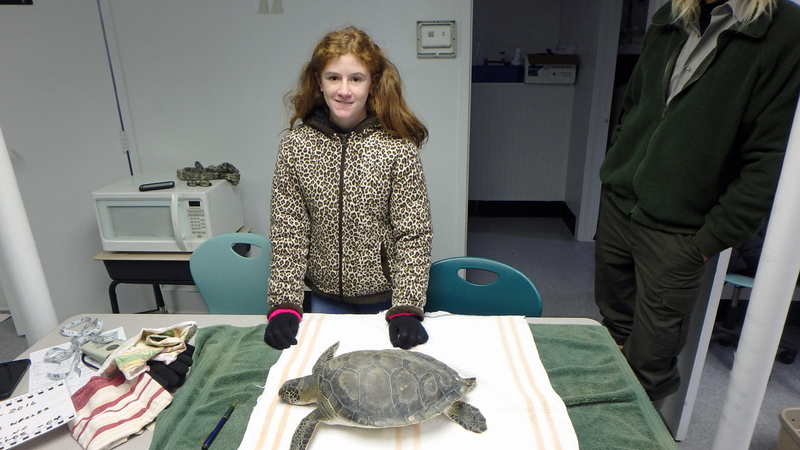 Like Haley, several other middle schoolers from Cape Hatteras Secondary School of Coastal Studies played prominent roles in the rescue of these endangered animals. They all belong to the Young Naturalist Club led by Linda Austin. You are never too young to begin your life as a conservationist. It is students like these who will make the planet a better, safer place for all of the critters that dwell here. They made a big difference on this small barrier island off the coast of North America. You can make a big difference in the world you live in! It will take all of us working together to preserve our planet and its entire species for generations to come. Together, we will do it!